Thanks to my colleagues’ trial of the pineapple tart making, Margaret and LinSi. 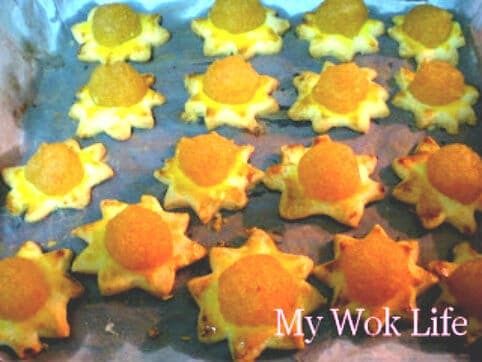 Their successful pineaple tarts making gave me confidence to set out my adventure in baking pineapple tarts, first time (chuckling). Both gave me their recipes, and I envisioned these two recipes as one to my first tart production of its own. A million of thanks to them! Of course, pineapple tarts are always one of the staple food of Chinese New year festival. I, too, want to make some for my loved ones. 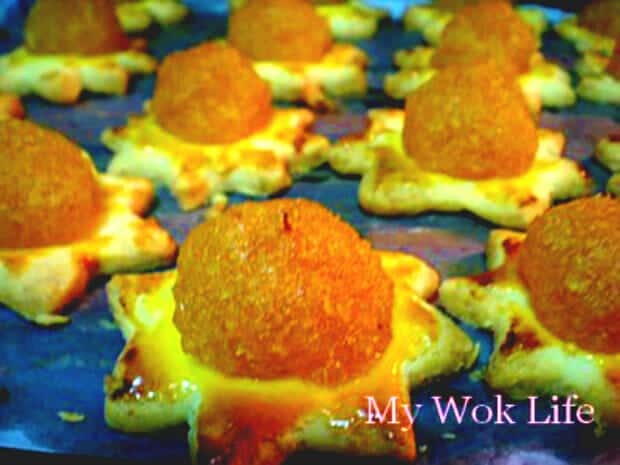 Called it the express version, we did the pineapple tarts using ready pineapple fillings (smilling)! Instant (ready-packed) pineapple jam is available in various supermarket stores. It is packed in a packet with the weight of about 300 – 500 gram, costs around S$5 – S$6 per packet. I used Redman brand from Phoon Huat. The premium version wasn’t very sweet and its consistency was just right (neither too dry nor wet). Not difficult to make the crust, but a little time consuming though. I used around 4 hours to complete few tens tarts. I baked 4 rounds as I have only 1 baking tray at a time (laughing). That makes me a 4-hour long baking job. Otherwise, it could be pretty “express” (winking smile). Oh ya, there is a harder part, the texture is always too soft to form the shape. Some taught to chill it in the refrigerator, some taught to add more flour. I chose the chilling method as I am worried that the baked crust will be too hard with too much flour. Different shape you made yields different consistency of this cookie. So, I had the tarts made in two different styles, just to have a feel of the difference in texture in the palate. Yes, remember to limit yourself with this all-time favourite festive food as each mouthful tart counts about 65kcal, FYI. 1) Sift plain flour. Mix flour, sugar and vanilla essence. 2) Rub butter with flour mixture till a dough is formed. 3) Chill in the refrigerator for 30 mins. Knead dough lightly. Dust kitchen table with flour, use a roller to flatten dough into 0.5 – 1cm thinkness. 4) Use a pineapple tart cutter to cut out the crust base. I used star shape bread mould to do as I do not have the actual pineapple tart cutter (laughing). 5) Brush tarts with beaten egg yolk. Then, place a small ball (about 20 cents big) of pineapple jam on top. 6) Preheat oven for 10 minutes, bake tarts at 170C (with both top and bottom heat) for about 15 mins, or until tarts turn into golden brown. 7) Leave to cool on wire rack, and store in air-tight cookie containers, when cooled. If no choice, your dough is too soft to be shaped with cookies cutter, do the pineapple cookies instead of tart crust (chuckling). 1) Repeat above steps 1 & 2. Instead of flatten the dough, roll it into long strips each about 0.5 – 1 inch thick in diameter. Make into half a thumb size big dough each. Knead and flatten it with finger tips into a layer of skin thickness. 2) Place a small ball of pineapple jam and wrap it around. Lightly pinch the edge of the dough to make it stick. (Remove away any excess when shape is formed, your pineapple cookies’ skin need not to be too thick). Roll to smooth and turn it into oval shape, as desired. 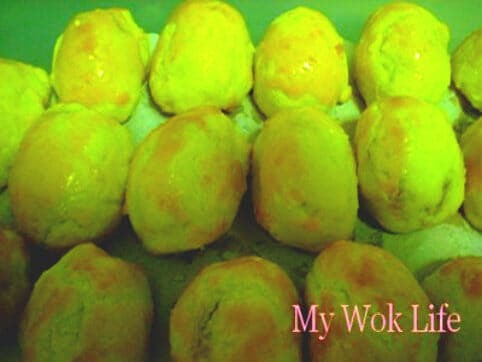 3) Polish cookies with beaten egg yolk. 4) Repeat above steps 6 & 7. Serve. The pineapple tart (star shape) yields more crispy crust. The pineapple is harder when bite, but the crust taste more fragrance in the palate. Conversely, the pineapple cookie (oval-shaped ball) yields softer texture. Feels soft in the palate, easy to bite for older folks and younger children. The pineapple filling is soft and more sticky in a sense. Same ingredients yielded different kind of consistency ot of it, I am not too sure why, but it happened. I prefer the cookies type. Tips: Need not to use electronic mixer, if you do not have one. Beat mixture manually using the whisk/ egg beater will do. * Butter should NOT be too soft, it has to be in semi-solid form with a little texture on your finger tips. Get Golden Churn Brand (from Margaret’s recipe). * Pinch some dough and roll into thin strips. Place on top of jam into a criss cross style, if desire. * Add 1 tablepoon of milk powder, if you prefer milky taste (from friend’s recipe). * Sprinkle a little of salt into the flour, if desired. * Use thread to create cross lines on the surface of the cookies for patterns, as desired. I’m always looking for new recipes to try, and am glad I found your blog! I like trying to make food from all kinds of cultures, so my son will grow up learning to eat many different types of foods and appreciate it all. I can’t wait to try these pineapple tarts! Thanks for visiting. I hope you try it and share your experience with me! Thanks. i wanted to make tarts using ready made pineapples too but i cannot decide on which brand.. i saw like singlong, glory.. and one other.. which is good? Just want to ask which brand of pineapple fillings for the pinepapple tarts are you using?? Pls recommend a good one and where to purchas. I used “Green” brand, bought from a neighbourhood supermarket named “Prime Supermarket”. However, you may also try to get another brand from Phoon Huat http://www.phoonhuat.com/. Actually, most of the decent brands are good to taste. Just love your blog and keep up the good work !!! hi, thanks for all the recipes. Do you know how long pineapple tarts can be stored in air tight containers? I think it is best to consume within a week or so, if kept in air-tight container. If store it in the fridge, it may last double the duration. Actually, I just found out that pineapple tarts can be kept more than 3 weeks, to 1 month time. Hi may i know if i can store the skin in the fridge overnight before baking it?